Topic for general discussion regarding the Nop Lavella Responsive Theme. 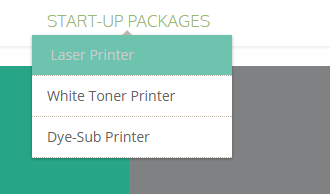 Where can you change the menu text color (the lime in the image) when you are hovered over a drop-down. The text is normally black, when you hover over it it turns to our teal, but when you're hovered over a drop-down it turns lime. We need to change the lime. It doesn't seem to be coming from any of the main style-sheets. I believe you want to change the background color on the sublist. If that is so, you can add the following code in 'administration --> Plugins --> 7 Spikes Plugins --> Nop Lavella theme --> Custom head styles'. Here you can use any color you want instead of 'lime'. You can set RGB or HEX value also. I hope that's what you want to accomplish. If there is something else, please write back and we will help you as soon as possible. Thank you! I did end up figuring it out. I do have another question though. I continually have to override this font color with the !important tag in CSS. Where is this color declaration coming from? I was looking to remove it but I cannot find it's existence within the theme. The css you are referring to comes from the color presets functionality in the theme. There is a less plugin that can be found in Plugins\SevenSpikes.Theme.Lavella\Styles\Less\preset.less. In this file you will see the css selectors that are used to generate this css with the hex code of the color selected from the admin -> plugins -> 7spikes themes -> nop lavella theme -> settings option. So basically when you save your color from the admin of the plugin, it uses the selected hex code to generate the css with the selectors and the hex code and injects this css in the head, so that you can see the theme with the selected color. Please let me know if you need any further help and information. Hello, can you tell me how to put the "featured category" and "featured product" like the demo in the homepage of my website?